How a chemist defeated thousands of poisoners. In 1800, there lived in Berlin a young woman named Sophie Ursinus. She was married to a senior politician, who was much older, and (possibly at his suggestion) she had a boyfriend, who was an officer in the Dutch army. Between 1800 and 1801, both her husband and her boyfriend died suddenly; so did her elderly aunt, leaving her a good deal of money. No questions were asked. But in 1803, shortly after Mrs Ursinus argued with her servant, he became ill, and became suspicious; he took the plums she had given him to a friendly chemist, who confirmed that they appeared to have been laced with arsenic. The law was called in. But there was then no reliable test for arsenic, and the pathologists could not confirm beyond a reasonable doubt that the exhumed body of her husband contained the poison, any more than it could have been detected at his post-mortem. Fortunately they were more sure when they examined the body of her aunt, and so Mrs Ursinus was sent to prison for thirty years. 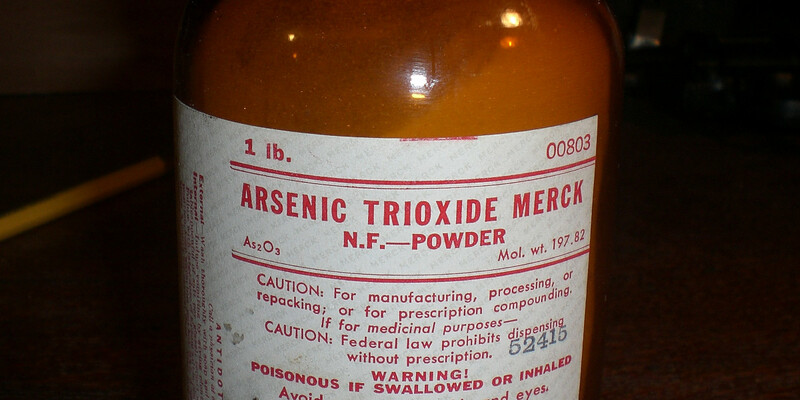 Arsenic was nearly the perfect poison: readily obtainable if you claim you're trying to kill rats, easily administered by mixing into your victim's drink, causing symptoms plausibly similar to those of various then-common illnesses such as cholera, and-- should you be found out in the end-- almost undetectable in the body by any reliable test. So many people used it to remove rich and elderly relatives who had survived inconveniently long that it became euphemistically known as "inheritance powder". In 1832 a man named John Bodle was accused of murdering his grandfather by putting arsenic in his coffee, and the prosecution called a chemist named James Marsh as an expert witness. Marsh discovered arsenic in the body, using the test developed by the homeopath (!) Samuel Hahnemann, which was the best available method at the time. But a positive result with Hahnemann's test deteriorates so fast that by the time of the trial the jury were not convinced, and Bodle was acquitted; he confessed his guilt as soon as he was protected by double jeopardy. Marsh was stung, and set out to discover a reliable test for arsenic. He found one, and published it in 1838: it has become known as the Marsh test. It builds upon the previous work of Carl Scheele, who had shown in 1775 that arsine gas (AsH₃) would result from treating arsenic with zinc and nitric acid. Marsh's breakthrough was to set fire to the arsine gas in the presence of charcoal, producing arsenic and water vapour, and staining the vessel with a silvery-black colour that came to be known as "arsenic mirror". (I apologise to my chemist readers if I have misunderstood any of this, and invite corrections.) Marsh's idea had its first successful outing in 1840, in the trial of a French poisoner named Marie Lafarge; so widely was this success reported in the news that poisoning one's relatives with arsenic became passé almost overnight. One interesting footnote: modern detective fiction began in 1841, with Edgar Allen Poe's story The Murders in the Rue Morgue. I doubt there's any direct connection, but the timing amuses me: detective fiction would be far less interesting with the easy availability of undetectable poisons!